Sunnyvale, Calif. – January 20, 2009 – Vitria Technology, Inc., a leading provider of business process management and business event management products and solutions, today announced that it was selected in the 2009 Editors’ Choice Awards by InformationWeek Business Technology Network’s Intelligent Enterprise. The online publication chose 48 companies that provide exceptional vision, technology innovation and customer leadership in attaining strategic objectives. Intelligent Enterprise named Vitria one of four companies to watch in 2009 in the category of Business Process Management. 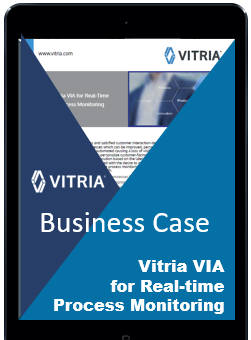 Long recognized as a leader in innovation, Vitria is again on the cutting edge by moving beyond traditional BPM to provide organizations groundbreaking capabilities that give users greater control to manage their business. Vitria M3O Suite is a complete business management suite that enables organizations to model, manage, monitor and optimize processes to meet their business challenges. It fosters true business agility by strengthening collaboration between business and IT. M3O Suite provides companies with the ability to meet business requirements and stay ahead of the competition. The Vitria M3O Suite is a unified business management suite comprising of business process management, business event management, and business activity monitoring. Together these capabilities provide the real-time, end-to-end visibility into business processes necessary to quickly and easily adapt those processes to meet changing market conditions and ensure governance and compliance to industry regulations and your business requirements.